Wedding rings do not have to be plain, or predictable. There are many beautiful choices for unique his and hers wedding rings for couples who would like the connection of matched rings without the common look of plain gold bands. A diamond ring for the bride, for example, can be unique with a paved band and scalloped insets, while the groom's ring may have contrasting metals accenting a single diamond. If you still want a simple band but with a unique look, try wedding rings with contrasting metals. The central band of the ring can be one metal, while the edging is different. White gold, silver, and platinum are beautiful when banded with rich yellow gold. For either the bride or groom, a single diamond accent can be a stunning detail. For a plain band with an edgy look, choose a design with sharp textures for depth and dimension. Simple hashing is a bold statement, and other popular choices include hammered or brushed metals, as well as herringbone patterns, braids, weaves, and etchings. This is an inexpensive way to add distinction to a wedding ring without needing diamonds or gemstones. For a stunning retro look, some couples choose art deco wedding rings with multiple stones arranged in bold, geometric patterns. A closed, wide band pattern is most popular for grooms, while brides' rings more often include open patterns and spaced lattices to capture the bold art deco pattern while still retaining feminine delicacy. Carved wedding rings have fantastic texture and can be found in a wide variety of patterns, such as vines and flowers, waves, crosses, swirls, Celtic knots, or customized designs. This style works best on a wide band where the pattern will be more visible, and it is possible to add diamonds or gemstones into the carved pattern as well. Instead of carving texture into the ring, the finish on the precious metal can give it a unique look. Shiny, polished metals are the most popular choices for wedding rings, but couples who choose a subtle brushed texture can enjoy the classic look of a simple band with a uniquely rich gleam. For added sparkle, a line of small diamonds is the perfect accent. A wide band with several diamonds of graduated sizes can serve as a beautiful wedding band for either a bride or groom, and the different sized diamonds evoke the look of a journey ring. This style represents beautifully the journey the couple is embarking on together as they wear those rings. With modern laser etching and polishing design techniques, intricate filigree details can be integrated directly into a ring's exterior, creating a stunning look either a bride or groom can enjoy. These designs can be customized if a couple wishes, or classic filigree, floral, or symmetrical patterns can be used. For many couples, they can find no more unique his and hers wedding bands than to choose heirloom or antique rings with a strong family history. 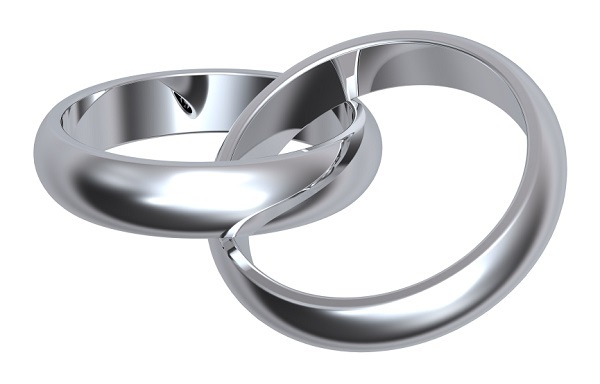 While the rings themselves may not be uniquely designed, the history they bring to the new marriage cannot be duplicated. If a couple does not have antique rings to use, they can visit estate dealers, antique shops, or pawn stores to find older rings for a unique style. A couple's rings do not have to match, and many couples both opt for unique wedding rings that are distinct from one another. A bride may choose a glittering halo ring design that includes a dual diamond ring wrap that encircles her engagement ring, while the groom may prefer a simpler design such as a thick band with several diamonds along the circumference connected by subtle etchings for continuity. Couples who do want matching his and hers wedding rings don't need to have each ring identical to be a coordinated set. Wide wedding rings made of layers of contrasting metals can be individualized with different widths for each ring, or the bride's ring may have diamond accents, such as framing a plain center with a glittering diamond circumference. Whatever rings you choose for your wedding, be sure to select styles that match your individual preferences. If the ring style is unique to you and your soon-to-be spouse, your choice of unusual his and hers wedding band rings will be symbolic for the love you and your beloved share.